Natural teeth play the crucial role of breaking down food as the first step of the digestion process. When a tooth is lost, the chewing efficiency of the oral cavity reduces and as a result, there is more workload on the remaining teeth. At this point your oral health can get compromised because of the problems that arise from missing tooth. As a solution to these problems teeth restorations have been developed to finely fill the gap caused from missing teeth. Among the many restoration options in prosthodontics, dental implants are the finest because of their ability to become an integral part of the oral cavity and support functionality of natural teeth. We at Smiles 'R' Us Dentistry Offices, perform dental implant surgeries in our Edison, NJ office. An experienced dental professional leads our team. We have the necessary equipment and facilities to perform the surgery and replace lost teeth with the help of these restorations. If you have any question about dental implant surgery, make an appointment and meet our dentist. Dental implants replace the lost tooth root. They are designed to bond with bone tissues and become an integral part of the supporting bone structure. Thanks to this integration, the implanted tooth is very stable and last longer. The restoration can address the following oral health problems that arise from missing teeth. When a tooth is lost, the chewing efficiency reduces and there is more workload on other teeth. Implanted teeth are proven to have very high chewing efficiency because of their stability. The gap created by having a missing tooth creates an imbalance in the dentition where the nearby teeth are pushed towards the gap leading to orthodontic problems. The crown that is fixed over the implant fills the gap and prevents nearby teeth from shifting. The tooth loss can cause the supporting bone to shrink because of the lack of stimulation from the tooth root. Implants integrate with bone structure and prevent it from shrinking. This is one of the major benefits of dental implants over other restorations. Almost any patient who has a healthy jawbone can get the dental implant. Our dentist will first perform a thorough oral examination to check for dental infection and finds out if the bone has enough volume to hold the implant. X-rays are taken and a treatment plan is framed. On confirmation that a surgery can be performed, our dentist explains how the restoration process takes place. The surgery is performed with the aid of local anesthesia. An incision is made in the gums and a bony recess is created using dental drills. 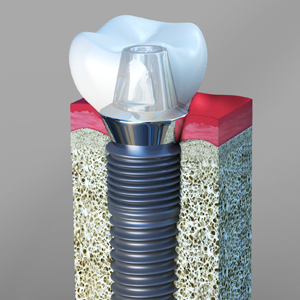 This paves the way for placement of the dental implant. The restoration is torqued in planned position and the gums are sutured back with the head of the restoration standing above the gum-line. The surgical area is left to heal for few months. This is the period when Osseointegration takes place. After the healing period, the dentist checks if the implant is stable. An abutment is fixed over the implant on confirmation that the restoration has successfully integrated with the bone. Impressions of teeth are taken to fabricate a dental crown. The crown replaces the natural tooth crown. It can be cemented or screwed over the abutment. Our team informs patients on how to care for the implanted tooth after the surgery is complete. With proper oral care, dental implants are known to last for a few decades. Do you want to replace your lost tooth with the dental implant? The surgical procedure performed at our Smiles 'R' Us Dentistry in Edison, NJ office may help you get a wonderful tooth restoration and a healthy smile.